Today we are sharing a super quick Apple Tree Lid Matching Alphabet Game that we put together. We just used a bunch of yellow, green, and red play-doh lids we had lying around. 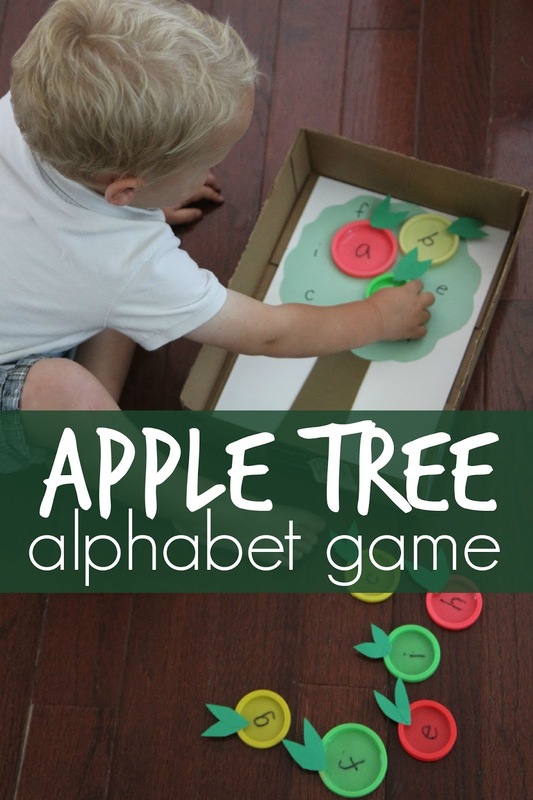 This activity helps kids match alphabet letters. 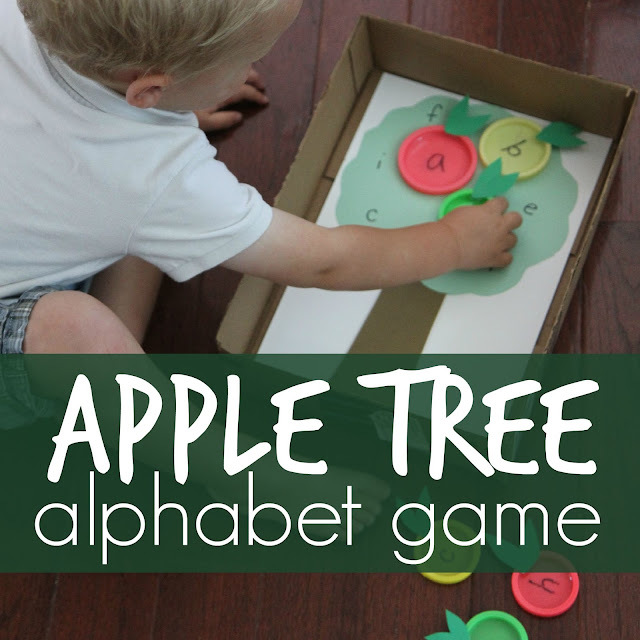 It is a simple visual discrimination activity and helps kids start to notice differences between the different alphabet letters. While we play we talk about the alphabet letter names and sounds. With older kids we'll talk about words that start with the alphabet sounds. To set up the game you first need to secure white cardstock on the bottom of the box and add on a tree trunk and tree top. Then you need to cover the tree with alphabet letters (we mostly just focused on the letters in my son's name since the whole alphabet would be too overwhelming for him). After that add some paper leaves to your apple lids using tape and write the alphabet letters on them using a sharpie. 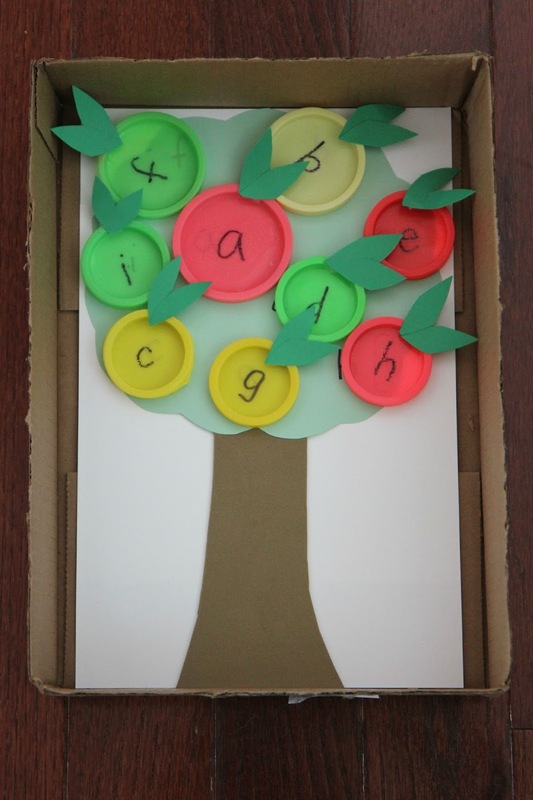 Make sure you have one lid to match each of the alphabet letters on the apple tree. Once that is all set up you are ready to play! Just have your child pick up one apple lid at a time and search for the matching letter on the apple tree and cover it with the lid apple. Once all of the apples are matched you can pick up the box and shake it so that all the apples fall down! Then just play again. Easy peasy! 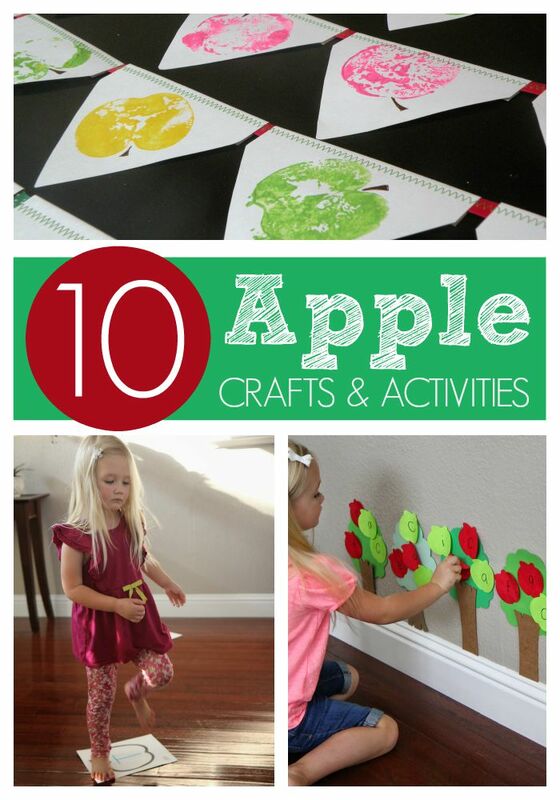 If your kids are into the apple theme like mine are here are 10 other favorite apple crafts and activities that we love!